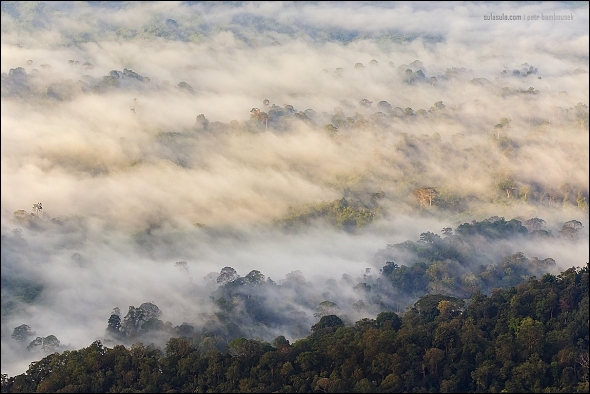 Petr Bambousek | Wildlife Photography | Behind the lens – Borneo I. Behind the Lens - Borneo I. Behind the lens – Borneo I. In my irregular series of stories behind my photographs, I’ll try to recount the circumstances of when some of them were being made. For this episode, I´ve selected three photographs from Borneo that all have something in common – night photography. Every single one, however, has a totally different story to tell. They were all taken during my photo-expedition to Borneo in March 2013. People write to me sometimes saying that my black-background photographs are too sterile. I’m aware of the fact that there are tons of photographs on the internet with various background interpretations. As for me, I like trying different approaches every now and then, with the view of avoiding my photos becoming too dull. I used to take most of my shots during daytime. You know the drill – get up very early before dawn to catch the perfect light and the same story for the evening light just before dusk. However, this routine kind of got disrupted during my last three trips to Borneo. That’s because on this island I very rarely am blessed with what we photographers call: “a perfect morning light”. Instead, I’m more than often put into situations that … well, aren’t exactly by the book. I love returning to Borneo because for a person with eyes wide opened, it brings an endless palette of opportunities for wildlife and nature photography. Most of the time, to take a picture of everything I see is near impossible. Not to exaggerate, but I see something I’ve never seen before on almost every single trip. However, during my post-processing I realised I had no idea how to present photographs. The weather on Borneo I experience was with a few exceptions almost always the same – overcast, rainy or bright sunlight. All three circumstances pose very high demands on correct exposure setting. Most often, it’s cloudy. In reality it means, that for example you may find a fascinating fly that is barely a centimetre long but after a closer study you notice huge eyes unbelievably stretched sideways. That means she is almost as long as her eyes are apart. Naturally, you must take a picture. You set your aperture maybe to 9, ISO to 1000 and press the shutter speed to set the length of time. 3 whole seconds! You check your camera because obviously this is not a way how to shoot the fly. You start messing with aperture and ISOs up to 3200 that with F2.8 gives you a relatively decent shutter speed of 1/25s. But that still won’t work. So you keep pondering. You obviously try a flash or some sort of artificial light, a different camera with higher ISOs, lenses with stabilisers and other gadgets that aren’t always from your camera bag. Well, to sum up, slowly but surely you are becoming a jack-of-all-trades and on your next trip you are prepared to compromise the amount of your clothing in favour of more and more photographic equipment. It was also thanks to my trips to Borneo that I got infatuated with night-time photography. Not because it’s easier but because there are totally different animals coming to life. A night shift starts, you may say. Whilst during a daytime you can see one or two walking sticks at night-time you’ll bump into ten or more. In short, rainforests have a different life during a night. And so, I started to work on a mini-project of mine, called Night Life in Rainforest to which I dedicated not only a whole section in my gallery but also this article. We will have a closer look at a really hairy caterpillar, a parasitic fungus that I discovered with my selective light and a night moth bigger than both of your palms together. When I go to any hardware store or an IKEA, I’m usually after completely different things than other customers. Others may see towels, boxes, plastic containers or toy baskets whilst I see flash diffusers, lens’ covers or insects’ nets. The other day I actually came home with a folding toy basket that I couldn’t wait to use on my next trip. A godsend for whole 99CZK (that’s about 4USD). True, I was struggling to pack it at least half decent but I was determined to shove it in somehow (or to somebody else’s bag). And boy, was I glad I did. There were days when we simply had too much to shot. And so, we kept putting there interesting specimens intended for later shooting when things were quieter. One day when I was about to go to bed, Kuba rushed into our lodge all excited about a beautiful caterpillar he’d just seen and couldn’t wait to photograph it the next day. But in the morning, we found a stunning pitviper, various reptiles and frogs. Sadly, our beautiful caterpillar was forgotten and I’d been regretting it for a while. Luckily for me, I was returning to Borneo half a year later. If you are expecting that my only aim was to shoot that caterpillar, you are mistaken. Even on this trip there were so many unattainable shots that I’d need to dedicate a whole trip to correct what was left out. On most days we were up till really late spending most of the night searching high and low with our torches for something worth photographing. We discovered a snake, sleeping lizards, walking stick insects, frogs, lantern bugs and God knows what else. After a while though, I grew tired of everything and realised the thought of lifting a camera one more time in order to conceive yet another photograph makes me sleepy. It’s OK to be excited for a day, maybe two or three. But after a week you just want to sleep. And so I left both Ondrejs and went back to our lodge to bed. Just out of habit I was flashing my torch around me and there she was. That hairy caterpillar I’d seen a year ago. However, I was so tired that for a while I was seriously contemplating to just keep walking towards my bed and leave her there. I’m glad to say that my instincts prevailed. I grabbed her and her leaf and shouted back at Ondrejs : “Maybe you wanna tell me how exactly you wanna go to bed when I found this?” We all burst laughing. And even though we all wanted nothing more than go to bed, we started setting up our impromptu night-studio. Ondrej sacrificed his tripod which I begged for placing high enough so that we don’t need to bend our backs. Not long after, all five of us started to take turns. Two of us would listen to instructions of two photographers on how to best light the scene and one would wait for his turn. We would rotate like this for a few hours. 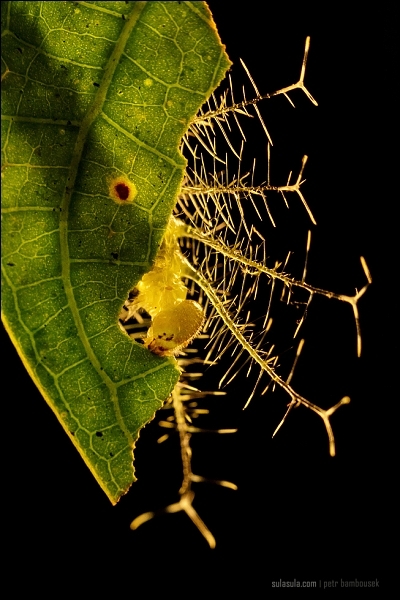 At first, the caterpillar would stop trimming her leaf but soon decided to blithely munch away. We kept this up till about 4am and satisfied with my results I’m happy to cross out from my wishlist yet another photograph that I longed to make. On my last trip to Borneo I stayed a week longer than the others and on the eve of their departure I went for a stroll in the garden surrounding our hostel. What I found that evening I never ever imagined even in my wildest dreams. At a first glance it looked like a horny caterpillar. On a second glance, though, I realised it’s in fact a parasitic fungus of the genus Cordyceps. I saw it first in one of the documents by David Attenborough and dreaming about seeing it at least once in my lifetime, I read about it many times ever since. Some studies show that the parasite can force for example an ant to climb higher up where it would be safer to grow. Shortly after, the ant’s nervous system is paralysed and it soon becomes as if petrified and dies. The fungus then finds its way out of the ant’s body. And that was exactly what I was looking at. Only, instead of an ant I was looking at fungus happily growing from a caterpillar. I told the fantastic news to my mates who politely declined and even I agreed on leaving it without photographing it. I left the fungi-caterpillar on a tree where I found it expecting it’ll be there tomorrow. And sure enough, it was right there where I left it. After dropping the boys off at the airport I went back to the garden. Possessed by a desire of immortalising that phenomenon I was determined to stay in the garden as long as it takes to find it. Unfortunately I’ve not marked my tree and so I was looking for the right one for over an hour. It was also a very windy day. So windy, it was obvious that a photograph on a tree was absolutely impossible. I pulled up my tripod and a chair on which I carefully placed a leaf with the fungi. The wind was much stronger though, and kept blowing the leaf away or swaying with it. In the end, it took me more than 2 hours from finding this specimen to taking a picture. 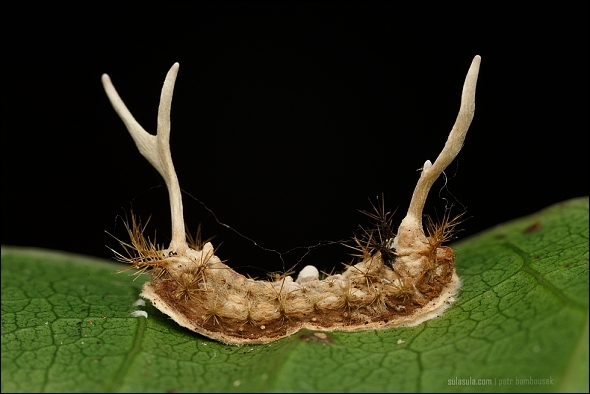 At first, it seems it’s just an ordinary shot of a horny caterpillar. For me though, it’s a little jewel that I brought home with me from Borneo. And there was another one waiting for me the very next day. On the next day I moved myself to my next location up in the mountains 1000m above sea level. Having a lodge this high meant that I should encounter different species I was used to. That was actually true but on the same account they decreased in numbers. If I saw three species in a day I was incredibly lucky. But it was worth it every time. If a saw a walking stick it was a metallic blue 10cm long one. I also saw a gorgeous crimson sunbird and on my very first night I saw THAT moth. Out of habit, I grabbed my torch and went for a stroll around 10pm. I returned swiftly after less than 30 minutes quite disappointed. If it wasn’t for some spiders I did not see a thing. I sat in reception and ordered my favourite drink 100plus (one day I’ll start importing this brand to the Czech Republic) but didn’t even get a chance to have a sip. 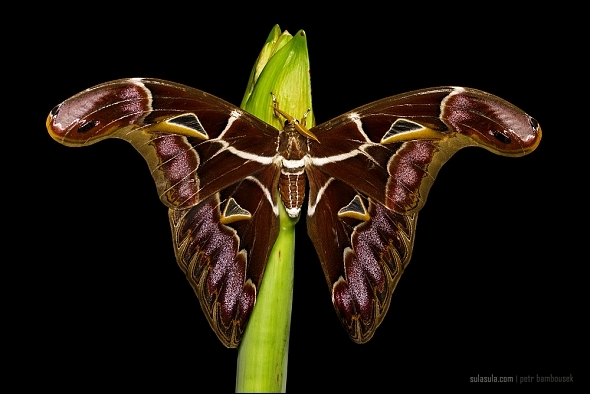 My eyes caught a sight of something huge sitting next to a wall clock – it was an incredibly large Atlas moth. Two girl-receptionists were just packing their things at the end of their shift and didn’t pay any attention to him. After I pointed him out to them they just nonchalantly waved their hands saying that he’s there almost every night. What for them was an everyday occurrence, was for me like apparition. I immediately threw myself into catching him. The problem was, though, that he was conveniently resting in that Reception Area that was out of bounds for visitors. I kindly asked for permission to enter behind their sacred desk and what followed must have been very amusing to them. These types of moths are very shy and so I managed to transfer him onto my finger. So far so good. But when I was carefully moving with him to my seat he just fluttered his giant wings and flew away on the opposite wall. With all eyes on me, I climbed on a coffee table managing again to transfer him on my finger. However, going back with him to my seat he again flew away and hid himself in receptionists’ paperwork safely behind their desk. On my third try he obviously had enough of my harassing him and lost himself outside in the darkness. I cursed quietly under my lips but he was instantly back and landed on my back right when I was climbing down from a pile of newly arrived lodge towels. Soon after, the girls gave up on watching me and went to bed as my chasing him lasted for quite a while. After a while, we both came to a compromise and the moth agreed to stay put right where I left him – in one of the plant pots in the lobby. I rushed as a fool into my room for camera hoping that when I return he’ll still be there. Calmed by the warm dimmed lights of the reception, he stayed exactly where I begged him to be. The lighting though, was a nightmare. In front of me, I had the most beautiful moth I’ve ever seen but in the worst setting imaginable. Totally frustrated by the results of the first round of my photography attempts I went to bed around midnight leaving the moth evidently content in his new place. Not surprisingly, after downloading the files on my laptop I was disappointed by the results. On all the images the moth had a wing out of focus. Convincing myself for about half an hour I decided to go down and try it again. This time with a tripod and lights. That turned out to be very difficult and time-consuming. When we were taking turns at lighting the scene with the hairy caterpillar there were two people at hand to position the light accordingly. I was totally alone, though. Notwithstanding, I managed to shoot it so that it can be printed on a large-scale format if needed, i.e. with higher depth of field. When I was there I also found other species of moths that I carefully put next to my Atlas and content with starting my very first moth farm, I went to bed. The next day, I was searching on the Internet what kind of a moth was it. I was certain that it wasn’t an Attacus Atlas as he is much lighter. It looked a little like an Archeottacus edwardsii but its wing pattern was different and not so fine. Eventually, I established it was a very rare Archeoattacus staudingeri that is exceptionally scarcely photographed in the wild. I’m really glad that this photograph of mine, is the most previewed photograph with over 5550 views in my online gallery. Needless to say, that not once during my week there, the moth flew back in. And so, these are my three night photography stories from Borneo. By the time I’ll post another one for you, why not view my Borneo gallery where every single photo has a story.